This is a natural gas prices update relating to the trade I placed late yesterday morning. It is the futures blog entry immediately preceding this one from the date 2012-12-04. I took a long position in January natural gas futures at an entry price of 3.565. The trading strategy I used to enter the trade was the MACD divergence indicator strategy. If you want to learn to trade futures using MACD divergences, click the link and check on this blog frequently to see it in action. As it stands this evening, 36 or so hours after the trade was initiated, I am up nearly 15 points. So far, this has been a very good trade. I am very happy with analysis, execution, and follow-through, up to date. I have already trailed my stop above my break-even point. Short of a dramatic gap down at some point, the worst I can do is still going to net me a profit. Let us observe a 60 minute futures trading chart for the January contract natural gas prices. 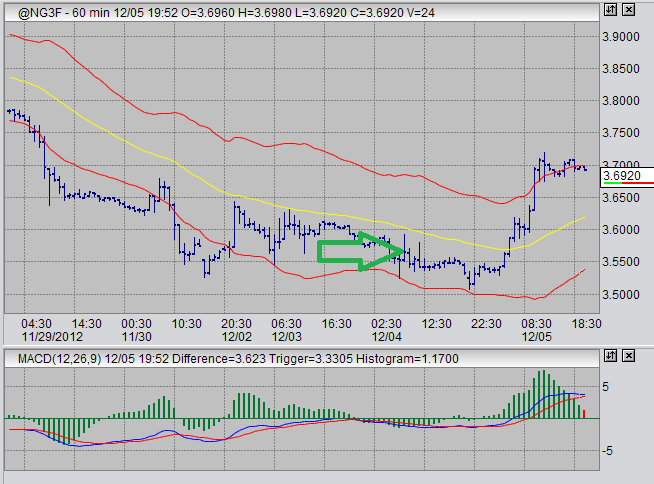 The green arrow in the image indicates my position entry at 3.565 at around 20 minutes to 11:00 in the morning (my time). You can see that, at the time, MACD was diverging from the new lows prices were making. New lows were made later that evening, but did not reach my stop-loss point. As a result, I held my position and saw it bear fruits early and late into the following morning. Natural gas futures prices have yet to show a bearish MACD divergence on the 60 minute chart, but I will be watching for one as an exit signal. Otherwise, I will keep trailing my stop if prices continue moving upwards until either the stop is violated or an exit signal shows up on the MACD. For now, I am anticipating higher prices. Tomorrow is the EIA natural gas storage report. It should cause volatility in prices. Hopefully the volatility is towards the bullish side. If not, I do have my stop-loss placed above my break-even point thanks to today's gains. In other markets, I am still looking for a good entry into sugar futures. I am waiting patiently, but continue to be quite bullish in this market. I am also watching gold for an entry opportunity, which may be just around the corner. I am watching crude oil. If crude prices drop about 3.00 from where they are now in the short term, I may be a buyer in that market. I am watching the USDX in a general way.